Kuzenbo is one of the playable Gods in SMITE. Kappa are devious creatures. They linger just below the surface of rivers and lakes, waiting for mortals to test the water before snatching and drowning their fleshy meal. Taken merely at their appearance and juvenile sense of humor, they could be mistaken for mischievous turtle-men, almost playful in a rude sort of way, but they are dangerously strong and ruthless when submerging their prey. King among these monsters is Kuzenbo; bigger, stronger, and more cunning than the rest, but just as infantile. Kuzenbo led his nine thousand Kappa followers to Japan, where they harried river villages and fishing boats, using their unnatural strength to pull mortals below. So clever, so hungry had the Kappa become, that Japan's army marched to fight back, but they were no match. As the bowl-shaped indentation atop a Kappa's head is filled with water, that Kappa grows impossibly stronger - far stronger than a mortal. Yet, bound by their strange sense of honor, a Kappa must bow when bowed to, spilling their power upon the ground. It is the only known way to defeat one. And of the countless battles Kuzenbo has fought, he was defeated only twice. Upon his second defeat at the hands of General Kiyomasa, Kuzenbo was forced to swear to never again sow strife between man and beast, a vow the Kappa King has honored ever since. Gods, however, are fair game. Only the first wall collision will deal damage. The time between each hit is 0.6s. 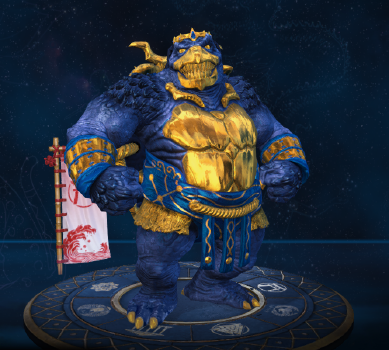 Kuzenbo is the fifth Japanese Pantheon god added to SMITE. Kuzenbo is voiced by Mike Pollock, who also voices Dr. Eggman in the Sonic The Hedgehog series. Additionally, Pollock also provides the voice of High Noon Sylvanus. Some of Kuzenbo's voicelines are in Japanese, most notably on his 3rd Ability, Sumo Slam, and his (VGG) General voicelines. One of Kuzenbo's voicelines when he uses his first ability, NeNe Kappa is: "Watch my NeNe!" which is a reference to the popular song Whip/Nae Nae by Silento. Kuzenbo makes several references to the Kappa emote from Twitch. Some of Kuzenbo's voicelines: "No problem, Kappa! "/"You look strong, Kappa! "/"Just stay right there, Kappa! I won't hurt you." are a reference to the popular emote 'Kappa' on streaming platform, Twitch. The emote is usually associated with sarcasm. One of Kuzenbo's taunts, "I was born in the dankest of streams!" could also be a reference to Twitch as well. The skin's name is a reference to the Makuuchi professional sumo wrestling circuit's rank of the same name, Yokozuna. This skin is most likely based on uniforms worn by samurai during the Sengoku Jidai period of Japan. 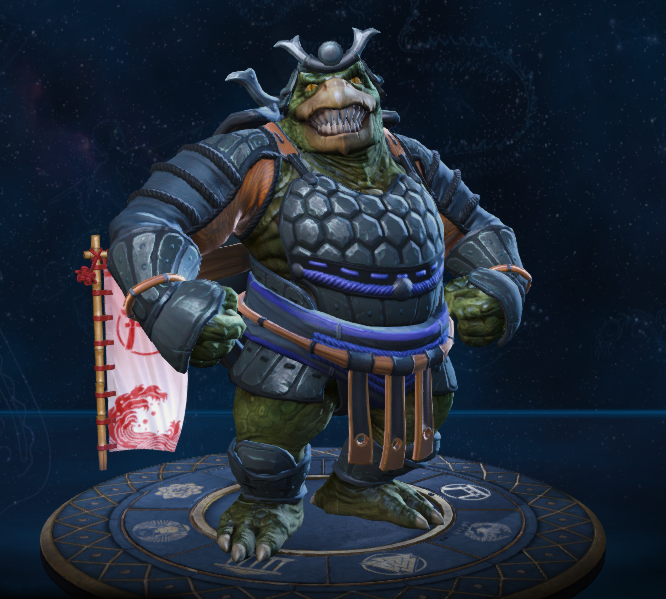 The skin's name is a pun on Kuzenbo's name and another name for a ninja, a Shinobi. This skin also has several voicelines in Japanese as well. This skin is a very clear reference to the Teenage Mutant Ninja Turtles series of comics, television shows, and action figures. 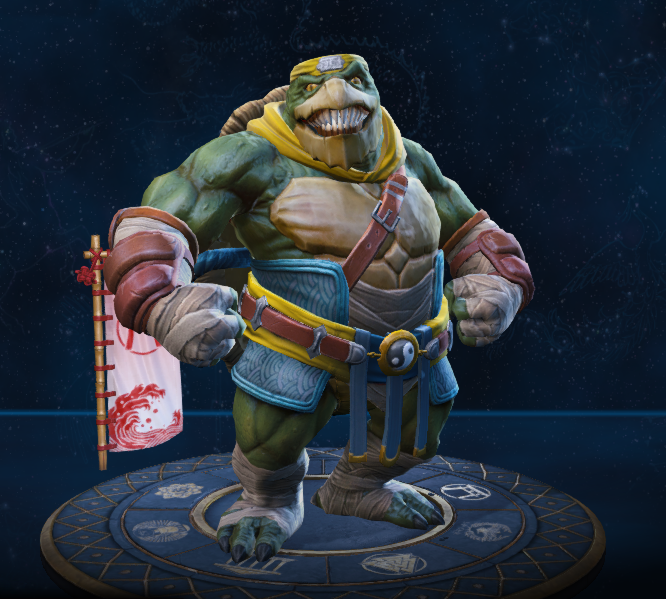 Several references to the Teenage Mutant Ninja Turtles series are also found out through the skin, including several voicelines, Kuzenbo's attire, cartoonish effects on abilities, and the green sludge that replaces the water bowl on Kuzenbo's head. This skin share its theme with Blind Vengeance/Silent Blade Nemesis, Kunoichi Serqet and Shinobalanque Xbalanque. This skin is a reference to the popular Kaiju genre of movies that became famous during the Showa era of Japan, and still run today. This skin share its theme with Kaiju Sobek. This skin's name is a pun on the old Christmas song, Jingle Bells. This skin is based on the legendary figure, Santa Claus. This skin was created as an side project of some devs and was unlocked by a quest for a short period of time. This skin shares its theme with Father Chrishmash Bacchus, Krampus Cernunnos, Slay Bells Chiron,Wreck the Halls Fenrir, Snowman Geb, Jingle Hel Hel and Nice and Naughty Nu Wa. The mountain in the background of the splashart is most likely Mt. Fuji. 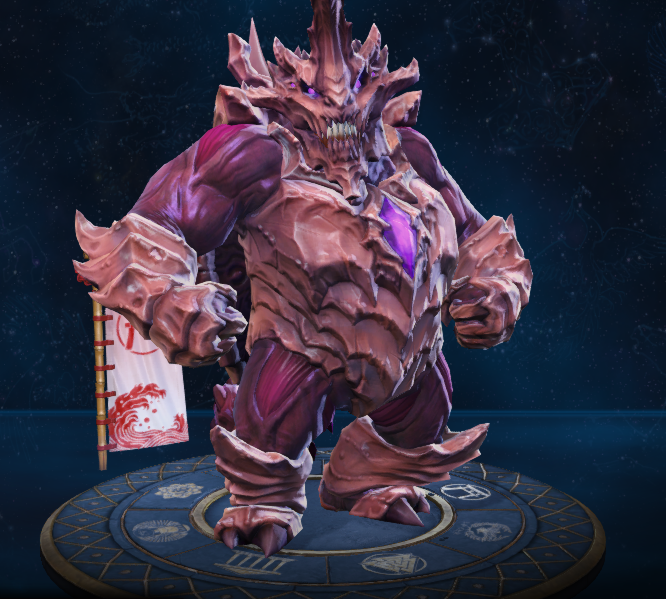 This skin was part of the Summer of Smite 2017 event. This skin was awarded to anyone who played at least one match during the 5.23 update. Reduced the forgiveness timer time between individual hits from 0.7 to 0.6. This was due to a bug where players would most likely not get hit 4 times in his ultimate even if they should have. Increased Damage reduction per stack from 1% to 1.5%. As a result, Maximum Damage Reduction increased from 10% to 15%. Decreased Damage Reflected from 20/25/30/35/40% to 10/15/20/25/30%. Decreased Mana cost from 50/55/60/65/70 to 50 at all ranks. This ability now decreases the cooldown of Sumo Slam as well as NeNe Kappa by the same amount. Increased Base Health Per Level from 95 to 100. Decreased Cooldown 16/15/14/13/12s to 12s at all ranks. Decreased Cooldown from 100s to 75s. Targets hit by the thrown NeNe Kappa are Slowed by 20%. Increase turn radius, allowing for sharper turning. Cooldown reduced from 16s flat → 16/15/14/13/12s. Adjusted the Knockup from this Ability. Targets will now be Knocked Up into the air more and pushed to the side less. NeNe Kappa now inherits 20% of Kuzenbo's current Health and Protections in addition to its base. Increased NeNe Kappa's Attack Damage from 25/35/45/55/65 → 35/45/55/65/75. Increased Cooldown Reduction on NeNe Kappa per Hit from .2/.3/.4/.5/.6s → .5/.7/.9/1.1/1.3s. Fixed an issue where this Ability could not be used while in a Knockup. Fixed progression on the stats page showing as “undefined”. Fixed a description error to properly convey the Damage Mitigation this Passive provides. Can now be activated while Kuzenbo is under the effects of Crowd Control. Increased Damage from 65/95/125/155/185 → 80/110/140/170/200. Reduced Duration from 2.8s → 2.1s (one less maximum Knock-up). Increased first hit Damage from 60/100/140/180/220 → 80/130/180/230/280. Increased per tick Damage from 30/50/70/90/110 → 40/65/90/110/140. Increased Movement Speed Buff from 35% → 45%. Fixed an issue where Kuzenbo could be Knocked-up during the warm-up for this Ability. Fixed an issue where his Passive Meter would appear full when respawning. Added sound effects for when this ability bounces off walls. Kuzenbo has been added to the game. This page was last edited on 22 February 2019, at 21:38.